For the song by Leroy Van Dyke, see Walk On By (Leroy Van Dyke song). "Any Old Time of Day (Bacharach & David)"
(1964) "You'll Never Get to Heaven (If You Break My Heart)"
"Walk On By" is a song composed by Burt Bacharach, with lyrics by Hal David for singer Dionne Warwick in 1963. The song peaked at number 6 on the US Billboard Hot 100 and number 1 on the Cash Box Rhythm and Blues Chart In June 1964 and was nominated for a 1965 Grammy Award for the Best Rhythm and Blues Recording. Isaac Hayes recorded the song five years later, in 1969, and reached number 30 on the Hot 100 chart and number 13 in the R&B charts with his version. "Walk On By" has since charted numerous times in various countries, with wildly different arrangements. 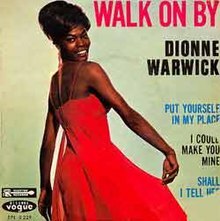 The original version of "Walk On By" by Dionne Warwick was recorded at the same December 1963 session that yielded her hit "Anyone Who Had a Heart". "Walk On By" was the follow-up to that single, released in April 1964 and reaching number 6 on the U.S. Billboard Hot 100 and number 1 on the Cashbox's R&B chart. (Billboard did not print rhythm and blues charts during 1964, the year of the song's peak performance.) The song also reached the top 10 in a run on Billboard's easy listening survey. The song was ranked number 70 on the Rolling Stone list of The 500 Greatest Songs of All Time, the second highest song by a solo female on the list after "Respect" by Aretha Franklin. "Walk On By" became Warwick's second international million seller following "Anyone Who Had A Heart" in January 1964. Session drummer Gary Chester played on this recording. Other musicians included Artie Butler and Paul Griffin on piano, George Duvivier on bass, Irwin Markowitz and Ernie Royal on trumpet, Bill Suyker and Allen Hanlon on guitar, Max Pollikoff, Charles McCracken, Eugene Orloff and Julius Held and George Ockner on violin, Harold Coletta on viola, Lucien Schmit on cello, Paul Winter on saxophone, and George Devens on percussion. The Toronto folk-rock group Bobby Kris and the Imperials released a fairly straight-ahead cover version in late 1965. The single became a major hit in Canada, reaching number 8 in early 1966, but "Walk On By" was to be the band's only hit. (1969) "The Mistletoe and Me"
Funk/soul musician Isaac Hayes released a cover version of "Walk on By" in 1969 for his studio album Hot Buttered Soul and transformed the song into a twelve-minute funk vamp. Edited for single release down to under 5 minutes, this single reached number 30 on the U.S. Billboard Hot 100 chart. This version was also featured in the film Dead Presidents and is sampled in 1992 by Compton's Most Wanted in "Hood Took Me Under", in 1995 by Tupac Shakur in "Me Against The World", in 2000 by Wu-Tang Clan in "I Can't Go to Sleep", in 1996 by Hooverphonic in "2 Wicky" and in R&B singer Beyoncé's 2016 song "6 Inch". In 1978, the Stranglers recorded a punk rock-sounding version of "Walk on By" (with extended organ and guitar solos) that hit No. 21 on the UK Singles Chart. The video for the Stranglers' version was based on the 1966 movie "Blowup" and was filmed in the same location as the movie, Maryon Park in London. The Average White Band cut a lightly disco-tinged version (featuring reggae and funk underpinnings) that charted in 1979. Though AWB is sometimes remembered as an instrumental band, their version of "Walk On By" was a vocal track—as were many of their other songs. In 1982, "Walk on By" was covered by the funk duo D-Train who had a UK and U.S. R&B/dance hit with the song in a boogie/funk version. In 1983, Australian group Jo Jo Zep covered "Walk on By" in a slow, moody version that featured electronics and synthesisers. The song was lifted from the band's seventh studio album, Cha. The track was a minor hit in Australia, peaking at number 55, but was a major hit in New Zealand, hitting number 6. In 1989, "Walk On By" was covered by singer Melissa Manchester. Her version of the song hit number 6 on the Billboard Adult Contemporary chart. In 1990, singer Sybil, who had scored her biggest hit a year prior with a cover of Warwick's "Don't Make Me Over", also scored a U.S. and UK hit with "Walk On By". In 1997, UK singer Gabrielle released her version of "Walk on By" as the fifth and final single from her studio album, Gabrielle. It reached number 7 in the UK Singles Chart. Despite being one of her bigger hits, it was not included on her Greatest Hits compilation in 2001, being the only Top 10 hit in her career not to appear on it. "Walk on By" was the first single from Cyndi Lauper's 2003 covers album, At Last. It was also included on Lauper's 2004 DVD Live at Last. It was released as a promo only. Remixes of the song reached number 10 on the U.S. dance chart. Seal released a version of "Walk On By" as a single in January 2005. Though the song did not chart in his native UK, it made the lower reaches of the charts in several European countries. Helen Shapiro recorded a version in 1964, released on her album Helen Hits Out! on Columbia Records. Roland Kirk recorded a version on his 1965 album Slightly Latin. Kirsti Sparboe on her 1965 album Kirsti Sparboe with Norwegian lyrics as Gå Forbi. Jack McDuff on his 1966 album, Walk On By. The Miracles recorded a version on their 1966 album Away We a Go-Go, one of two Dionne Warwick cover tunes on that album. Pucho & His Latin Soul Brothers recorded a version on their 1966 album Tough!. Gábor Szabó recorded a jazz instrumental version on his album, Gypsy '66. Brenda & the Tabulations on their 1967 album, Dry Your Eyes. George Benson released a jazz version of the song on his 1968 album, Gilblet Gravy. Sherwin-Williams compilation of 1960s hits titled Easy Does It (1968). Florence Ballard recorded a version in 1968 for her shelved solo debut album for ABC Records; after her firing from the Supremes and departure from Motown. The incomplete album was left unreleased until the 2001 compilation The Supreme Florence Ballard. Stan Getz on his 1968 album of Bacharach & David versions What the World Needs Now. Johnny Mathis recorded the song for his 1968 album Love Is Blue. The Beach Boys covered a portion of the song in a studio outtake for their 1969 album, 20/20. Thee Midniters recorded an instrumental version on their 1969 album "Giants"
We Five released a version as a single in 1969. It was featured on their album, The Return of the We Five. Grant Green recorded an instrumental version on his 1971 album, Live at Club Mozambique. Kevin Coyne released the song as a single in 1976. Whitney Houston performed the song several times in 1994 during her Bodyguard Tour, and also performed it on her 1997 HBO special Classic Whitney Live from Washington, D.C..
Maggie Reilly recorded a version of the song for his 1996 album, Elena. Bob Baldwin released a version of the song on his 1997 album, Cool Breeze. Paul Rodgers recorded a version of it on his 2014 album The Royal Sessions. ^ "Walk on By - Dionne Warwick - Songs, Reviews, Credits - AllMusic". AllMusic. Retrieved 25 September 2018. ^ Whitburn, Joel (2004). Top R&B/Hip-Hop Singles: 1942-2004. Record Research. p. 609. ^ "The RS 500 Greatest Songs of All Time". Rolling Stone. Retrieved 2012-09-13. ^ "The Official Gary Chester Website – Discography". Angelfire.com. Retrieved 2014-04-08. ^ "Geh Vorbei (Walk On By)". You Tube. Retrieved 2015-08-03. ^ "Vampire Diaries!". Strangled.co.uk. Retrieved 17 January 2015. ^ "End of Year Charts 1990". Recorded Music NZ. Retrieved December 3, 2017. ^ "Music & Media: Eurochart Hot 100" (PDF). Music & Media. Retrieved June 21, 2018. ^ "Íslenski Listinn Topp 40 (NR. 212 Vikuna 13.3. '97 - 19.3. '97)" (PDF) (in Icelandic). Dagblaðið Vísir. Retrieved July 12, 2018. ^ "Official R&B Singles Chart Top 40". officialcharts.com. ^ "Tracks on Helen Hits Out! - Helen Shapiro (November 1964) - SecondHandSongs". Secondhandsongs.com. Retrieved 17 January 2015. ^ We Five, There Stands the Door: The Best of We Five Retrieved March 7, 2012. ^ "Kevin Coyne - Walk On By". 45cat.com. Retrieved 25 September 2018. ^ "Reflections CD Sequel Is Next For Peter White". Allmusic.com. ^ "Cool Breeze overview". *Allmusic.com. ^ "CD Review of Bob Baldwin – Cool Breeze". JazzReview.com. "Three Wheels on My Wagon"
"(I'm in a) Dancing Mood"
This page was last edited on 10 March 2019, at 02:01 (UTC).